With one foot in Burgundy and the other in the Jura, and a couple of steps from the banks of the river Saone, at the heart of the historic town of Auxonne, our hotel of 9 rooms and restaurant offer you a warm welcome throughout the year. Opposite Notre Dame Church the restaurant has seating for 50 diners, with the terrace accomodating a further 30. It opens from tuesday till saturday, for lunch time till 1:30 pm and for diner from 7:00 pm till 8:30 pm during the week and 9:00 pm during the week-end (closed on sunday). For lunch monday, only the special of the day is proposed. The bar only for hotel customers is opened from monday till saturday from 5:00 pm till 7:00 pm. The hotel*** is opened from monday till saturday from 5:00 pm till 9:00 pm. The house is not smoking, doesn't accept animal inside (restaurant and hotel) and is not equiped to welcome people with reduced mobility (no lift for the hotel, rooms on the first or the second floor). 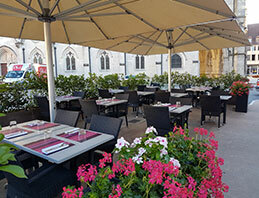 Located in front of the church it has a dining room of 50 places and a terrace of 30. The hotel reception is open from Monday to Saturday from 5 am to 9 pm. 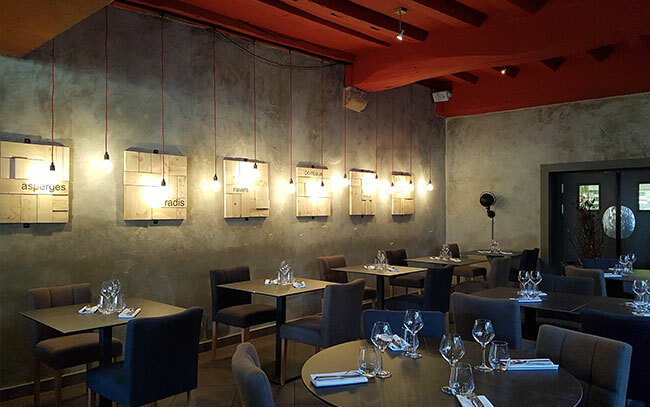 Access our reservation tools to book a room or a table at the restaurant.